Please include our announcement in your member newsletter. If you list 3rd party websites on your site, please include this site. Please distribute this announcement at meetings and events. Please post about HelpForCancerCaregivers.org on Facebook. Please consider including our post on family caregiving on your blog. When you're finished, please also help us improve Help for Cancer Caregivers by answering 6 quick question. Caregiving can be one of the most important roles in a person's life. It can be rewarding. And, it can take an emotional and physical toll. Caregivers are at increased risk of anger, anxiety, depression, fatigue, fear, loneliness, sleep problems, and other issues. Caregivers need support. 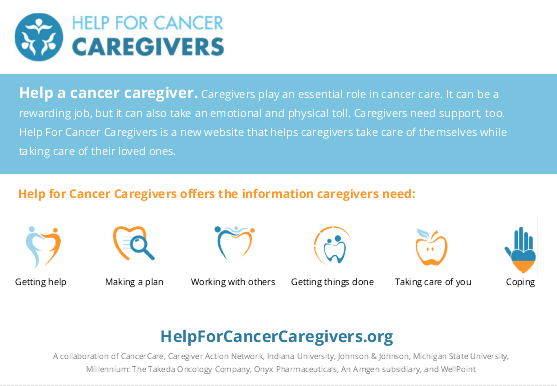 Help for Cancer Caregivers is a new website that provides valuable information on: making a caregiving plan, taking care of yourself (while caregiving), getting help, coping with caregiving, and other topics. Help for Cancer Caregivers was created by a collaboration of organizations with a shared goal of improving the health and well-being of the people who care for people with cancer, including Anthem, Inc., CancerCare, Caregiver Action Network, Indiana University, and Michigan State University. Please be sure to tell any caregivers you know that there is now Help For Cancer Caregivers. Help For Cancer Caregivers is a new website dedicated to helping the people who care for those with cancer. Check out the new and improved Help for Cancer Caregivers website at http://ow.ly/wiEut. Overwhelmed by the stresses of being a #familycaregiver of a person with cancer? Get help at http://ow.ly/wiEut. #CancerCaregivers often overlook the importance of taking care of themselves. Get help at http://ow.ly/wiEut. Looking for resources to help you navigate the journey of being a #CancerCaregiver? Get help at http://ow.ly/wiEut. Calling anyone with a loved one with cancer! Help for Cancer Caregivers can support you in your journey as a family caregiver. Learn more by visiting http://ow.ly/wiEut. Do you know someone caring for someone with cancer? Are you looking for ways to help? Tell them about Help for Cancer Caregivers at http://ow.ly/wiEut. The website offers tips and resources to improve the health, well-being and effectiveness of the family caregiver. Read and link to our Guest Blog from John Schall, Chief Executive Officer, Caregiver Action Network. Contact us if you want a custom post on caregiving for your Blog!